July 2015 – It's Hamiltime! On December 22, 1799, a young woman named Elma Sands disappeared from her New York City boarding house and was found 11 days later at the bottom of a well owned by Aaron Burr’s Manhattan Company. Sands’ suspected lover and killer, Levi Weeks, was defended in court by co-defense counsel Alexander Hamilton, Aaron Burr, and Brockholst Livingston. The case, which was America’s first recorded murder trial, has been the subject of several non-fiction and fictional accounts. In preparation for my talk at Federal Hall on July 13, 2015, I read several of these accounts as well as the newspaper accounts and transcripts of the trial. 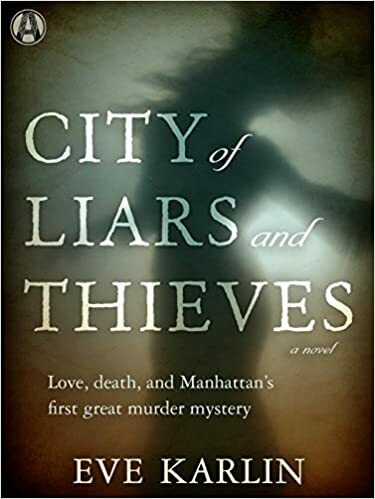 One account I particularly enjoyed was Eve Karlin’s historical fiction novel City of Liars and Thieves. Karlin’s book presents the story of Elma’s disappearance and the subsequent high profile murder trial through the lens of Catherine Ring, Elma’s cousin and close friend. By putting the story through the eyes of a character who would normally be relegated to the historical background, Karlin offers a fresh new perspective on a historical mystery. The novel provides insight into the turmoil and unrest in New York in 1799, after the city was recovering from a yellow fever epidemic, reeling from the news of George Washington’s death in December 1799, and struggling to provide clean water for its citizens. Amidst all of these events, Elma Sands’ murder prompted a massive outpouring of public sympathy and fascination. The death of Elma Sands brought the entire City of New York to a standstill and prompted an unprecedented degree of national curiosity. Karlin weaves historical facts in with a richly imagine backstory of conspiracy, mystery, and tragedy for a gripping read. The trial of Levi Weeks, her supposed lover and son of a prominent builder who had connections with three of the most prominent lawyers of the day, led to throngs of people flocking to New York’s City Hall. Urban legend tells us that at the conclusion of the trial, after Levi Weeks was affected, Catherine Ring pointed in the direction of counsel’s table and cursed Hamilton that if he should die a natural death there would be no justice in heaven. The formal trial transcripts don’t capture this aside, but Karlin’s novel imagines the need for answers and sense of helplessness that the victim’s friends and family may have suffered. The ebook is available from Amazon for $2.99. If you’ve read it, share your thoughts in the comments section! The infamous Manhattan well where Elma Sands was found (now located at a COS store in SoHo) and the site of the trial (Federal Hall National Memorial) are both accessible to the public, so if you’re in New York and interested in the historical mystery, I encourage you to visit both! 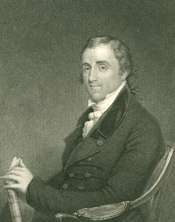 Fisher Ames, an influential Massachusetts Federalist and famed orator, gave a speech about Hamilton’s life and legacy immediately after his death. Ames entered Harvard University at age 12, and graduated by 16. He was well known both for his oratorical skills and his deep resistance to Jeffersonian democracy. Interestingly, before the election of 1800, Ames sent Hamilton a series of letters urging him not to split the Federalist Party and put Jefferson in power (which is exactly what happened). Hamilton broke with Ames and many of his other fellow Federalists by supporting Jefferson over Burr in the Senate tiebreaker in the election of 1800. Nevertheless, Ames delivered a heartfelt oration after Hamilton’s death, describing his unique role in creating the nation, the universal grief surrounding his death, and the impact of his legacy. Ames described how the news of Hamilton’s passing had paralyzed the nation. In contrast to other eulogies and orations delivered after Hamilton’s death, Ames directly tackled the Republican rumors surrounding Hamilton’s corruption and the consequences of his “frankness” in writing the Reynolds Pamphlet in 1797. Ames suggested that Hamilton’s talent was so immense that it inspired the suspicion of his enemies and they attributed motions of corruption despite lack of cause. On Monday, July 13, 2015, I’ll be speaking on the Manhattan Well Murder trial, in which Alexander Hamilton and Aaron Burr successfully defended Levi Weeks from the charge of murdering his alleged lover, Elma Sands. The case is interesting for several reasons: the ongoing mystery surrounding the murder itself, the rare courtroom collaboration between Hamilton and Burr, and the insight it provides into the criminal justice system in New York in 1800. The murder and trial are the subject of two recent historical fiction novels: City of Liars and Thieves by Eve Karlin, and Duel with the Devil by Paul Collins. The talk will be at 12-1:30 pm at Federal Hall on Monday July 13, 2015 and admission is free. Federal Hall (where the trial of Levi Weeks as held in 1800) is located at 26 Wall Street. The talk is free, and is part of the series of Celebrate Hamilton events put on by the Alexander Hamilton Awareness Society. Far from attempting to excite your emotions, I must try to repress my own, and yet I fear that instead of the language of a public speaker, you will hear only the lamentations of a bewailing friend. But I will struggle with my bursting heart, to pourtray that Heroic Spirit, which has flown to the mansions of bliss. At the time when our government was organised, we were without funds, though not without resources. To call them into action, and establish order in the finances, Washington sought for splendid talents, for extensive information, and, above all, he sought for sterling, incorruptible integrity—All these he found in Hamilton. The system then adopted has been the subject of much animadversion. If it be not without a fault, let it be remembered that nothing human is perfect. Recollect the circumstances of the moment—recollect the conflict of opinion—and above all, remember that the minister of a republic must bend to the will of the people. The administration which Washington formed, was one of the most efficient, one of the best that any country was ever blest with. And the result was a rapid advance in power and prosperity, of which there is no example in any other age or nation. The part which Hamilton bore is universally known. Brethren of the Cincinnati—There lies our chief! Let him still be our model. Like him, after a long and faithful public service, let us cheerfully perform the social duties of private life. Oh! he was mild and gentle. In him there was no offence; no guile. His generous hand and heart were open to all. Gentlemen of the Bar—You have lost your brightest ornament. Cherish and imitate his example. While, like him, with justifiable, with laudable zeal, you pursue the interests of your clients, remember, like him, the eternal principles of justice. Fellow Citizens—You have long witnessed his professional conduct, and felt his unrivalled eloquence. You know how well he performed the duties of a Citizen—you know that he never courted your favour by adulation, or the sacrifice of his own judgment. You have seen him contending against you, and saving your dearest interests, as it were, in spite of yourselves. And you now feel and enjoy the benefits resulting from the firm energy of his conduct. Bear this testimony to the memory of my departed friend. I charge you to protect his fame—It is all he has left—all that these poor orphan children will inherit from their father. But, my countrymen, that Fame may be a rich treasure to you also. Let it be the test by which to examine those who solicit your favour. Disregarding professions, view their conduct and on a doubtful occasion, ask, Would Hamilton have done this thing? On July 11, 1804, Alexander Hamilton and Aaron Burr began their fatal duel in Weehawken. After Hamilton was mortally wounded, he was taken by boat back to New York City, where he passed away the following day. In a letter to William Coleman (Hamilton’s friend and the editor of the New York Post), Dr. David Hosack, Hamilton’s attending physician, described Hamilton’s moments after the duel. Dr. Hosack’s full account is available from Founders Online. Dr. Hosack first described calling out to Hamilton and finding him after he had been shot. Dr. Hosack determined that the only chance that Hamilton had to survive would be to get onto a boat and go to New York City immediately for treatment. When called to him, upon his receiving the fatal wound, I found him half sitting on the ground, supported in the arms of Mr. Pendleton. His countenance of death I shall never forget. He had at that instant just strength to say, “This is a mortal wound, Doctor;” when he sunk away, and became to all appearance lifeless. I immediately stripped up his clothes, and soon, alas! ascertained that the direction of the ball must have been through some vital part. * His pulses were not to be felt; his respiration was entirely suspended; and upon laying my hand on his heart, and perceiving no motion there, I considered him as irrecoverably gone. I however observed to Mr. Pendleton, that the only chance for his reviving was immediately to get him upon the water. We therefore lifted him up, and carried him out of the wood, to the margin of the bank, where the bargemen aided us in conveying him into the boat, which immediately put off. As the party approached the shore, Hamilton gave Dr. Hosack instructions as to how to break the news to his wife, Eliza. Perceiving that we approached the shore, he said, “Let Mrs. Hamilton be immediately sent for—let the event be gradually broken to her; but give her hopes.” Looking up we saw his friend Mr. Bayard standing on the wharf in great agitation. He had been told by his servant that Gen. Hamilton, Mr. Pendleton, and myself, had crossed the river in a boat together, and too well he conjectured the fatal errand, and foreboded the dreadful result. Perceiving, as we came nearer, that Mr. Pendleton and myself only sat up in the stern sheets, he clasped his hands together in the most violent apprehension; but when I called to him to have a cot prepared, and he at the same moment saw his poor friend lying in the bottom of the boat, he threw up his eyes and burst into a flood of tears and lamentation. Hamilton alone appeared tranquil and composed. We then conveyed him as tenderly as possible up to the house. The distresses of this amiable family were such that till the first shock was abated, they were scarcely able to summon fortitude enough to yield sufficient assistance to their dying friend. In his last hours, Hamilton spent time with his wife and children, and expressed his anxiety for their future and their grief. During the night, he had some imperfect sleep; but the succeeding morning his symptoms were aggravated, attended however with a diminution of pain. His mind retained all its usual strength and composure. The great source of his anxiety seemed to be in his sympathy with his half distracted wife and children. He spoke to me frequently of them—“My beloved wife and children,” were always his expressions. But his fortitude triumphed over his situation, dreadful as it was; once, indeed, at the sight of his children brought to the bed-side together, seven in number, his utterance forsook him; he opened his eyes, gave them one look, and closed them again, till they were taken away. As a proof of his extraordinary composure of mind, let me add, that he alone could calm the frantic grief of their mother. “Remember, my Eliza, you are a Christian,” were the expressions with which he frequently, with a firm voice, but in pathetic and impressive manner, addressed her. His words, and the tone in which they were uttered, will never be effaced from my memory. At about two o’clock, as the public well knows, he expired. Multis ille quidem flebilis occidit.